Ajman: He is Indian by birth, but many UAE residents know Izin Hash as an Emirati boy — as that is how they have seen him in many ads. As the UAE celebrates its 47th birthday, this six-year-old is enjoying the fame he has earned by acting as an Emirati child in advertisements of various prominent companies and projects. 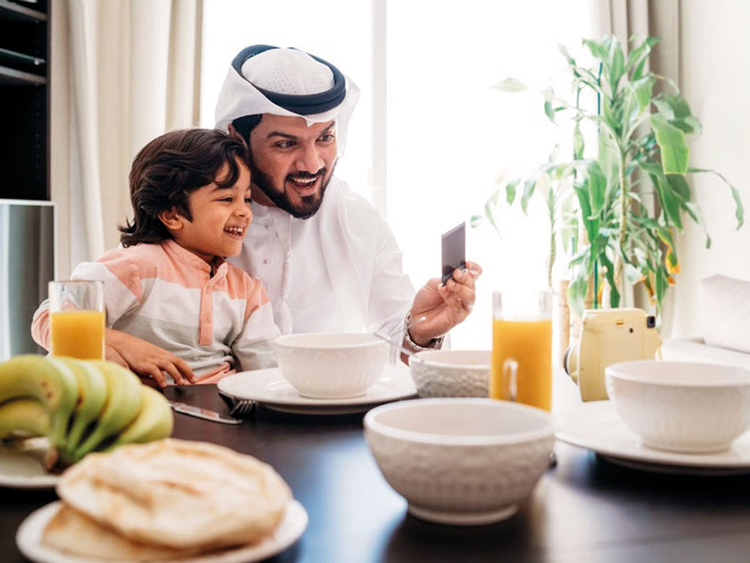 Izin and his parents are happy that his resemblance to Emirati children has earned him name and fame in the advertising circles, making him the face of young Emiratis in various promotional campaigns. The KG2 student of International Indian School, Ajman, has featured in dozens of ads. We are so grateful to the UAE, its rulers and the Emirati community for everything that we are enjoying here, especially in Izin’s case. Warner Bros, Liverpool, Du, Standard Chartered Bank, Ikea, Centrepoint, Home Centre, Jaquar World, Nissan Patrol, Total, Pediasure, Red Tag — the list of popular brands Izin has endorsed is growing along with him. Izin has also been featured in promotions of government agencies like Dubai Tourism, Abu Dhabi Government and Dubai Summer Surprises. He has also acted as a Saudi child, in Saudi Energy Efficiency and Mall of Saudi ads, shot in Dubai. When he sports a white kandura and ghutra, Izin looks perfect as an Emirati/Arab kid. “This is an advantage that has given him so many opportunities,” his father Hash Javad said. It’s exactly why Izin’s face is likely to pop up on Shutterstock or Getty Images, if you google for Dubai/UAE/Emirati people’s stock images. “We are so grateful to the UAE, its rulers and the Emirati community for everything that we are enjoying here, especially in Izin’s case,” said Hash. The little boy’s parents, who hail from the South Indian state of Kerala, sensed he had scope in acting or modelling after their cute child started striking poses for photos as young as age two. Incidentally, a video in which three-year-old Izin kept crying for his father’s iPhone went viral among the expat community. Hash, who works in visual media, realised his little prince had the charm and charisma to win viewers’ hearts. Izin shot to international fame when he was picked from among children of various nationalities to interview football legends Steven Gerrard and Gary McAllister earlier this year. The promotional video of Liverpool Fan Club’s LFC World was released by Standard Chartered Bank. Whether it’s still photos, video shoots or fashion shows, Izin is now a pro at it all, said his mother Naseeha. “Many kids do not listen to the crew at the shoot. But, he is very obedient and loves what he does. So, they are all very happy with him,” she said. His Facebook page @IzinHashOfficial has been verified, undoubtedly something very few children of his age achieve. Izin has a good following on Instagram (@izinhash) as well, thanks to his father who manages his social media accounts. Izin cannot remember the first ad he did, nor does he know exactly how many he has featured in so far. But he knows his favourite: the one shot with his favourite superheroes at Warner Bros, obviously! A movie in which he has played the lead role has been nominated among the finalists for Happiness Movie Award, scheduled to be announced on December 12.